Excellent detailing, perfect casting and clear instructions. An easy upgrade that will add highly visible detail to an already good kit. HK Models’ 1/32 B-25J kit is impressive in terms of both size and quality. While I haven’t had a chance to examine it in detail, I’ve read several reviews that emphasise the overall finesse of the kit’s mouldings. 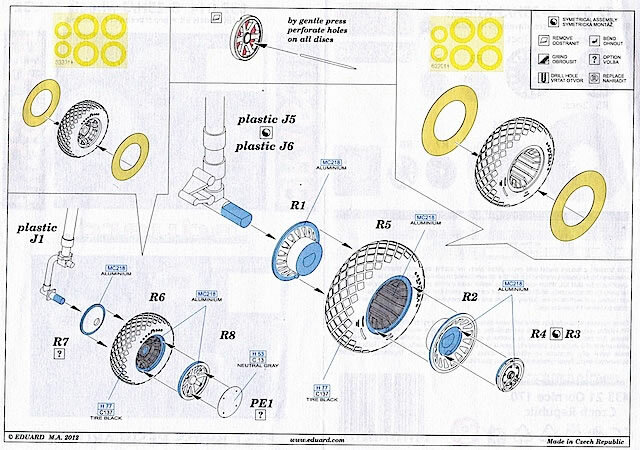 Only a few parts have been suggested as requiring aftermarket replacement, amongst them the wheels. 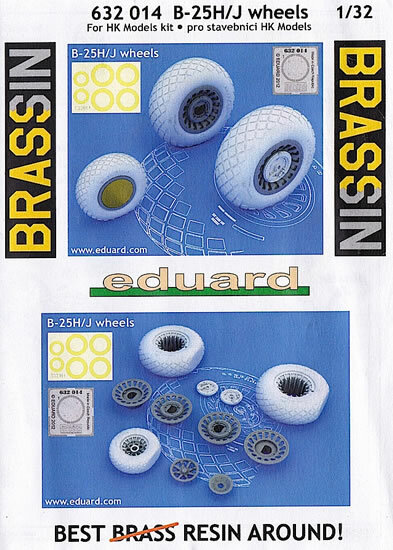 Eduard has reached the same conclusion, and responded with a comprehensive Brassin package. 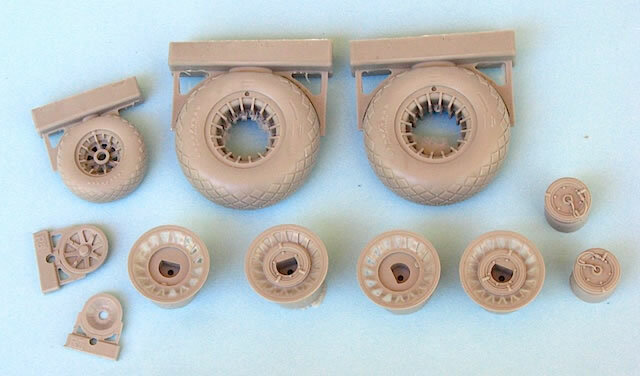 Eduard’s set includes two main wheels and one nose wheel, all with subtly weighted, diamond tread tyres – several different treads were used on B-25H/J tyres, so check your references for the aircraft you are modeling. The castings are sufficiently crisp that the ‘Good Year’ name and logo are clearly legible, which I think is obligatory in 1/32. Hub detail is also good, and builds up in layers starting with some delicate rim castings on the wheels. Separate hubs are then applied over the rims, which should create an effective sense of depth and busyness. Last of all – for the main wheels – come the outer faces, complete with brake hoses. 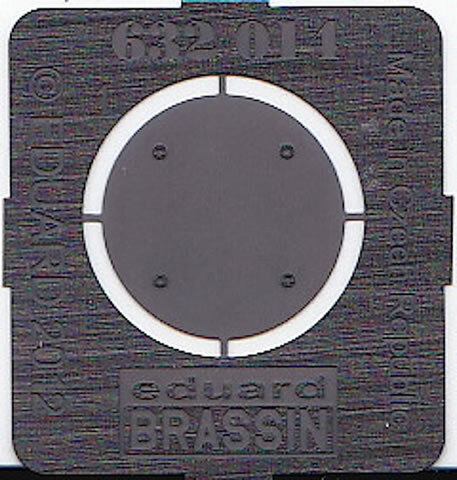 An optional, photo-etched cover plate is provided for the nose wheel should you wish to use it. 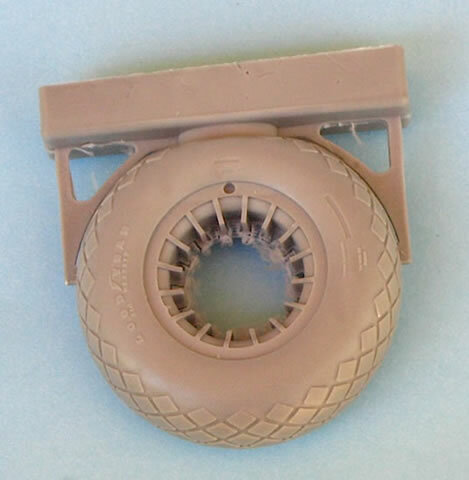 Painting of the wheels will be made significantly easier by the die-cuts masks provided. 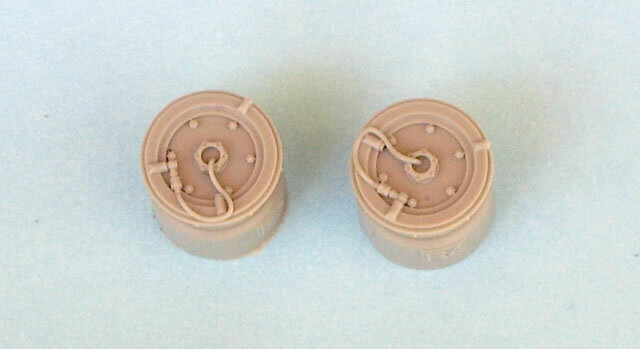 The resin parts in the review sample are all perfectly cast, with no pinholes or other flaws. Some wafer-thin flash will need to be rubbed away from the wheel rims and hubs. Eduard has designed the casting blocks for easy removal, although a razor saw – and steady hand – will still be required. 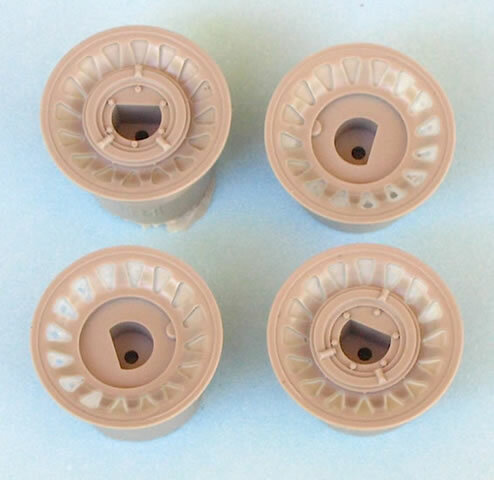 This wheel set will deliver a highly visible upgrade to HK Models’ B-25 kits, for only a little more work than would be required to complete the equivalent kit assemblies. It’s also good value, given the size of the resin castings – I’ve included a matchbox in one of the photos to convey a sense of scale. 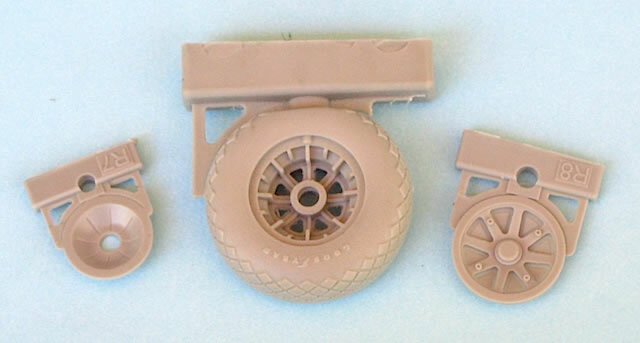 With careful painting, these big wheels will be amongst the highlights of an already impressive kit. Lou Drendel, "Walk Around: B-25 Mitchell" (Squadron/Signal Publications, 1997).